New research on the teeth of fossilized dinosaur embryos indicates that the eggs of non-avian dinosaurs took a long time to hatch–between about three and six months. The study, led by scientists at Florida State University, the American Museum of Natural History, and the University of Calgary, was published in the Proceedings of the National Academy of Sciences and finds that contrary to previous assumptions, dinosaur incubation is more similar to that of typical reptiles than of birds. The work suggests that prolonged incubation may have affected dinosaurs’ ability to compete with more rapidly generating populations of birds, reptiles, and mammals following the mass extinction event that occurred 65 million years ago. Because birds are living dinosaurs, scientists have long assumed that the duration of dinosaur incubation was similar to birds, whose eggs hatch within 11 to 85 days. 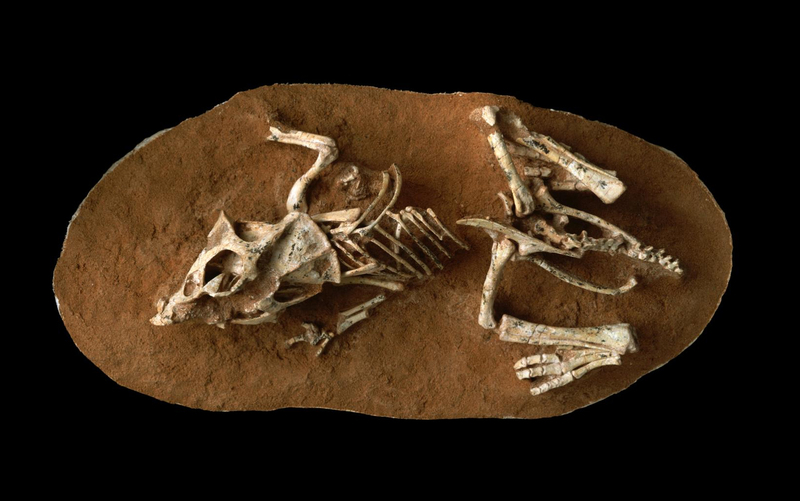 The research team tested this theory by looking at the fossilized teeth of two extremely well-preserved ornithischian dinosaur embryos on each end of the size spectrum: Protoceratops–a pig-sized dinosaur found by Norell and colleagues in the Mongolian Gobi Desert, whose eggs were quite small at 194 grams, or a little less than half of a pound–and Hypacrosaurus, a very large duck-billed dinosaur found in Alberta, Canada, with eggs weighing more than 4 kilograms, or nearly 9 pounds. First, the researchers scanned the embryonic jaws of the two dinosaurs with computed tomography (CT) at the Museum’s Microscopy and Imaging Facility to visualize the forming dentitions. Then they used an advanced microscope to look for and analyze the pattern of “von Ebner” lines–growth lines that are present in the teeth of all animals, humans included. This study marks the first time that these growth lines have been identified in dinosaur embryos. Using this method, the scientists determined that the Protoceratops embryos were about three months old when they died and the Hypacrosaurus embryos were about six months old. This places non-avian dinosaur incubation more in line with that of their reptilian cousins, whose eggs typically take twice as long as bird eggs to hatch–weeks to many months. The work implies that birds likely evolved more rapid incubation rates after they branched off from the rest of the dinosaurs. The authors note that the results might be quite different if they were able to analyze a more “bird-like” dinosaur, like Velociraptor. But unfortunately, very few fossilized dinosaur embryos have been discovered. The study also has implications for dinosaur extinction. Prolonged incubation exposed non-avian dinosaur eggs and attending parents to predators, starvation, and environmental disruptions such as flooding. In addition, slower embryonic development might have put them at a disadvantage compared to other animals that survived the Cretaceous-Paleogene extinction event.